Shirts With Random Triangles: Arkansas DC Robb Smith joining new Minnesota head coach PJ Fleck's coaching staff. 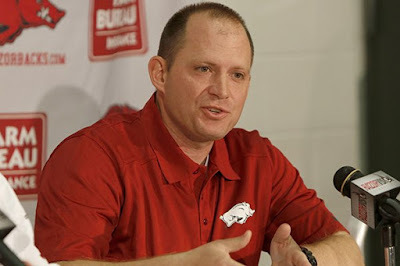 Arkansas DC Robb Smith joining new Minnesota head coach PJ Fleck's coaching staff. Robb Smith. Image via WholeHogSports. It looks at though new Minnesota head coach PJ Fleck's coaching staff is starting to take shape. ESPN's Adam Rittenberg reports that Arkansas defensive coordinator Robb Smith will be hired for the same job at Minnesota. Smith has been DC for Arkansas since 2014. According to cfbstats.com, Arkansas ranked 75th in total defense for the 2016 season. Fleck was named as head coach of Minnesota on Jan. 6, following the firing of then Golden Gopher Tracy Claeys.